If you think Mahendra Singh Dhoni is good at only cricket, you’re wrong. The veteran Indian cricketer has time and again proven his versatility in other sports. It’s perhaps time to add another one to the list. In Mumbai for a promotional event, Dhoni stepped on to a kabaddi mat as a part of the ongoing Premier Kabaddi League, an international kabaddi league in India. 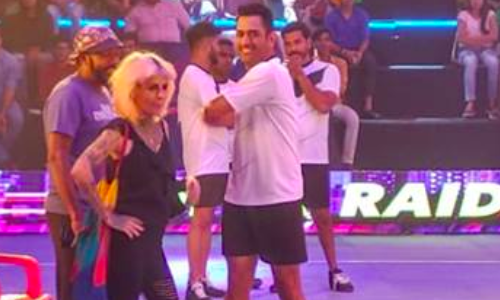 As can be seen in photos published by his management team, Dhoni showed off his athletic physique wearing a t-shirt, black shorts and shoes of the same colour. Meanwhile, Dhoni has been enjoying some downtime after being dropped from India’s 3-match T20 International series against Australia. Chief selector MSK Prasad, however, said Dhoni was ‘rested’ in a quest to explore more wicket-keeping options. “He [Dhoni] is not going to play the six T20Is [West Indies and Australia] because we are looking at the second keeper’s slot,” Prasad had said. Captain Virat Kohli, too, confirmed Dhoni is still in the scheme of things. “I think the selector has already explained what happened and I don’t think I need to sit here and explain it more,” Kohli had said.